Fallen bricks of an 1853 railroad depot were integrated into the new facade. 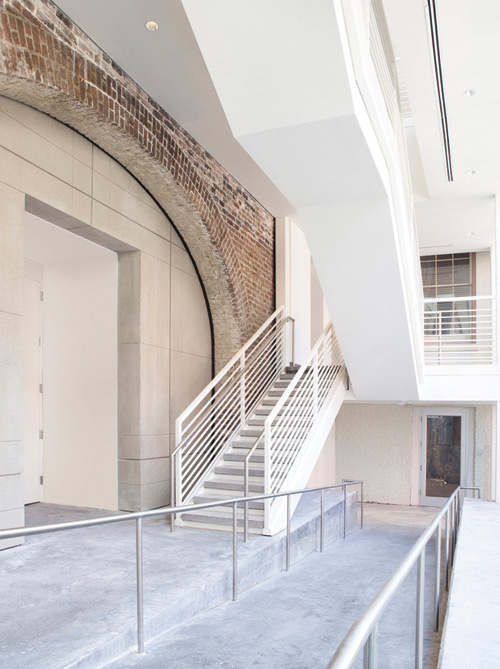 “The Savannah College of Art and Design (SCAD) Museum of Art is more than a preservation project,” said architect Christian Sottile, “It is where a new structure gives life to the old.” Situated in the historic landmark district of Savannah, Georgia, the 82,000-square-foot gallery space—including an outdoor theatre and event terrace— just two years ago was the site of rubble. The destitute walls of Savannah gray brick, some precariously leaning and others morbidly collapsed, were a relic of the country's last remaining antebellum railroad complex. 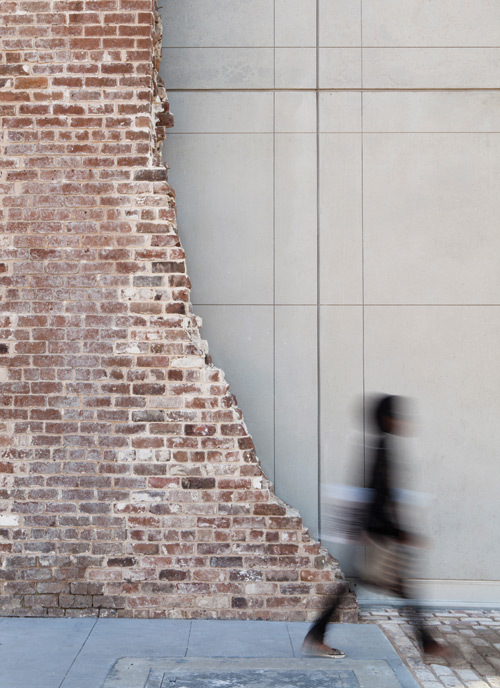 When the city's Historic Review Board insisted that SCAD, who owned the site, secure the remnants of the former railway depot to prevent it being razed to the ground, SCAD responded by hiring Sottile, a SCAD alumnus and local architect who also taught at the college. 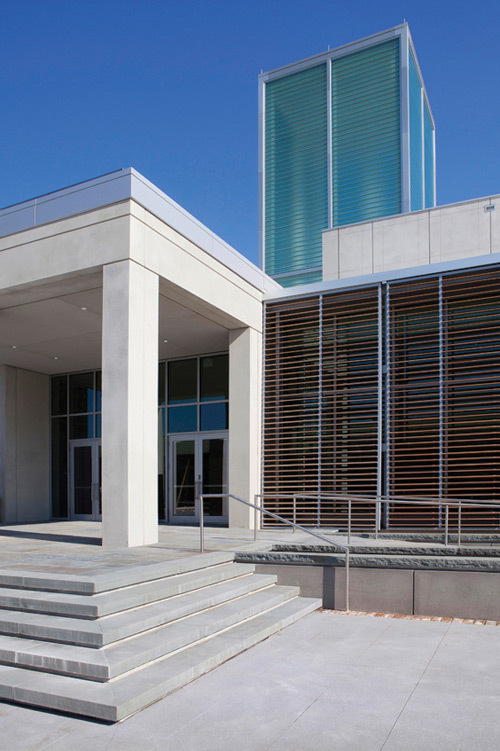 This October, the SCAD Museum of Art opened to the public. 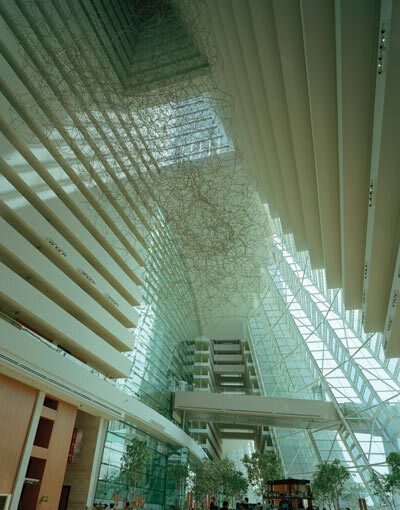 Key to Sottile's design from the start was the inclusion of the original materials. The brick walls were pinned to styrofoam and cast in situ to smooth concrete walls that seem to sprout from out of these fragments, while the fallen bricks were repurposed as pathways and are sewn into the streetscape along the east-west stretch of Turner Street. Here “jewel boxes” form a street-side gallery where protruding glass encasements frame artwork hung on a recessed panel behind. Inside, existing brick arches between galleries break up the white cube interior into three main gallery spaces, and in the auditorium, wood from the former depot has been repurposed as wall panels. 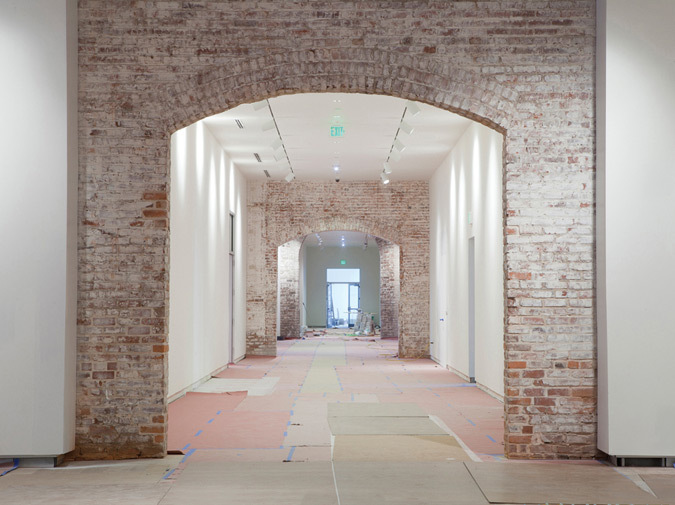 Left to right: An old brick archway juxtaposed with a new stair; original brick arches divide new galleries; old structure meets new; the courtyard. On Martin Luther King Boulevard, behind the mid-19th century Greek Revival facade that is the original SCAD museum, a 500-square-foot addition sits within the former North Depot's linear configuration, mirroring an adjacent warehouse block that houses SCAD's School of Building Arts (also renovated by SCAD in the late 1980s). The new building rises two stories and is accessible from the original museum entrance by way of a circulation junction known as “the gasket.” In the center, the museum spills out into a courtyard space to form an outdoor theatre and connects a direct path to a huddle of student housing to the west. The North Depot's original 800-square-foot footprint means that there is room for expansion. 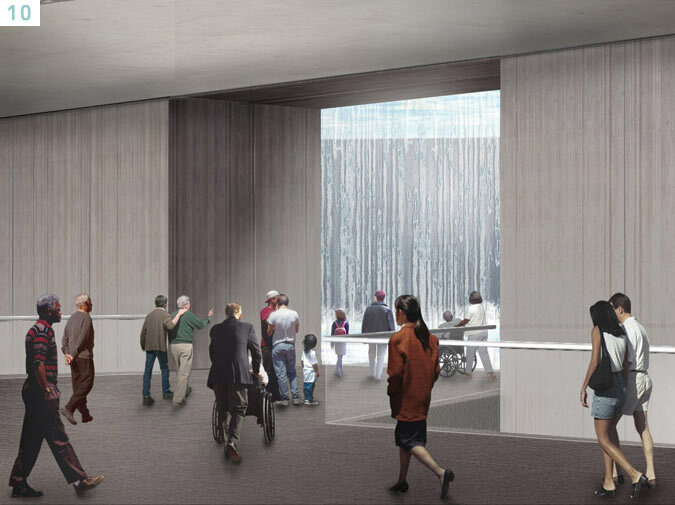 Until funds have been found, however, the 300 square feet of grassy area at the western end of the museum, delineated in part by the original brick walls propped up by steel brackets, offer a further outdoor exhibition space. 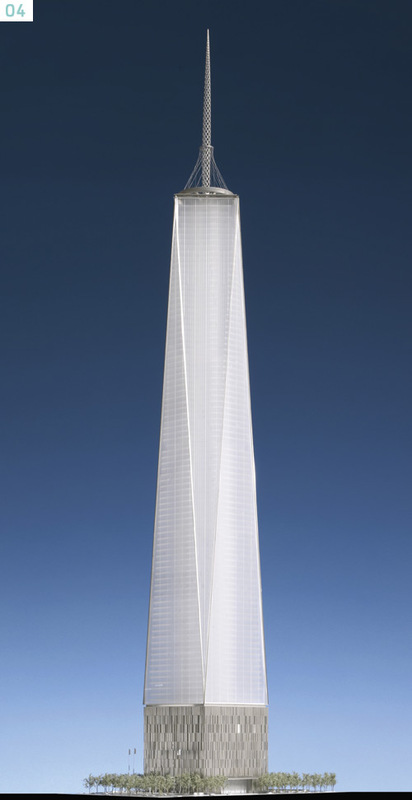 Visibility was also a concern for Sottile, and atop the main entrance of the extension is a 86-foot-tall lantern made from a steel frame and channel glass bricks. The c-shaped blocks interlock to resist earthquakes and severe hurricanes, and their structural striations also repeat the overarching theme of linearity. The rectangular glass tower joins the spires and domes of some of Savannah's oldest buildings, standing out as one of a few new icons in the skyline of the carefully preserved city, once gifted to President Lincoln by General Sherman following its capture at the end of the Civil War. 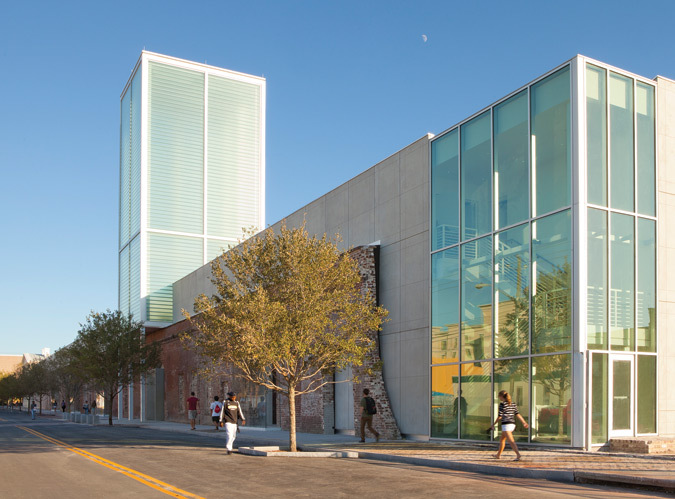 The historic city boasts significant new architecture, such as Moshe Safdie's 2008 building for the expansion of the Telfair Museum, but SCAD’s museum takes its place as an extraordinary project that harnesses history rather than mimics it. 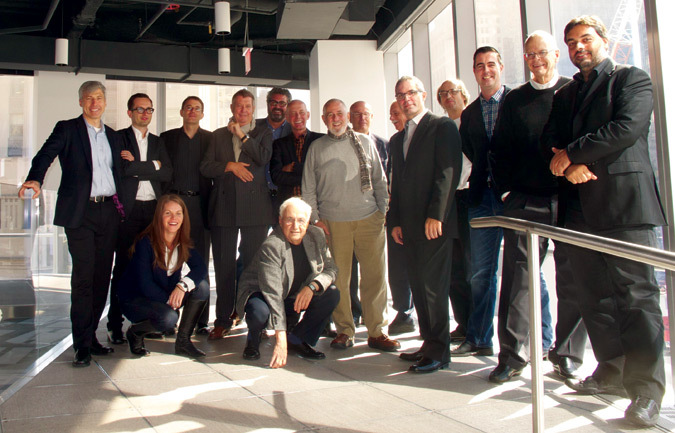 The new in-crowd advising Gehry Technologies. Gehry Technologies (GT), the Frank Gehry company that provides software and technology consulting to design and construction firms, announced a plan in late October to bring together "the world's most distinguished architects" in a "strategic alliance" with a lofty goal: to transform the building and design industries through technology. Put in more modest terms, the firm has put together a star-studded advisory board. 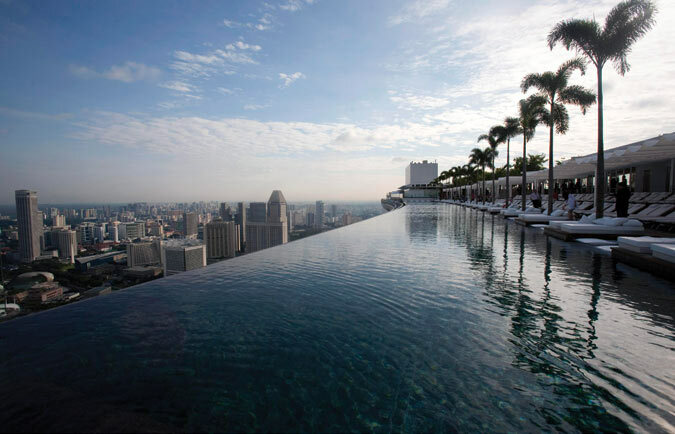 The list of architects, designers, and business leaders in the group includes David Childs, Zaha Hadid, Greg Lynn, Laurie Olin, Wolf Prix, David Rockwell, Moshe Safdie, Patrik Schumacher, and Ben van Berkel. Gehry Technologies CEO Dayne Myers and its chief technology officer Dennis Shelden told AN that the group, which will meet in person once a year and via conference call quarterly, will work to promote higher quality projects, to improve design through technology, and to address the industry's crippling wastes in time, money, and materials through better work flow and communication. 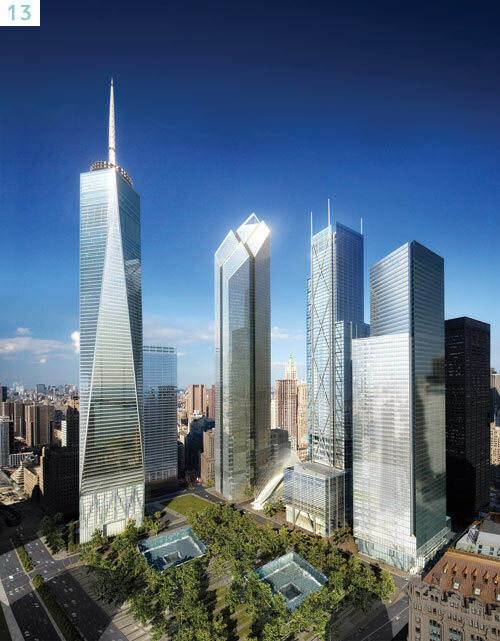 The group’s inaugural meeting was held at Seven World Trade Center in New York. "When this group speaks it will carry a bigger weight than any of them individually, or just Gehry Technologies," added Shelden. GT, which was founded in 2002, is made up of architects, engineers, computer scientists, and management consultants. 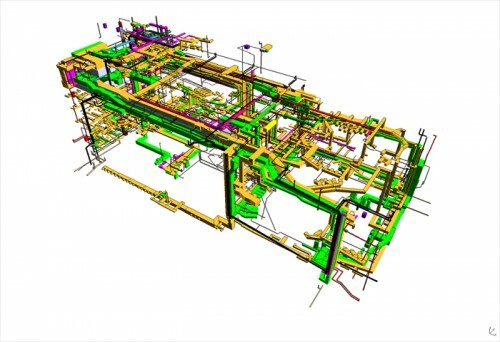 Along with providing technology-related consulting the firm has created Digital Project, a CATIA-based building information modeling (BIM) system, and is now coordinating with Autodesk on BIM-related initiatives. Lynn pointed out that the board is made up of people known for innovating in several fields who will now bring that expertise to improve the often chaotic role of technology in construction. “It’s really a sea change,” said Lynn, when talking about how improved software and management could minimize problems for architects such as litigation, multiple bids, change orders, miscommunication, collecting environmental data, and even the dominance of contractors and project managers. Additionally, Doscher wondered if the board members, regardless of their impressive pedigrees, were really up to speed on the latest technologies: “The wizards behind [the board members] are brainstorming what needs to happen in the industry.” Another architect, Austin Kelly of the small LA firm XTEN, praised “anything that allows designers to maintain control of a project” but worried that the technologies the board is promoting were out of reach for smaller firms, which make up the majority of practices in the country. However, Doscher felt that could change in the next few years. Either way, there’s no telling what the alliance will achieve until it actually starts to meet on a regular basis. “You’ll have to ask me in two years,” said new board member David Rockwell. Frank Gehry is trying to save architecture, and it's about time. His company Gehry Technologies, which provides technology and related services to design and construction firms, on Tuesday announced a plan to bring together "the world's most distinguished architects" in a "strategic alliance" intended to transform the building and design industries through technology. In other words they've put together a really impressive advisory board. 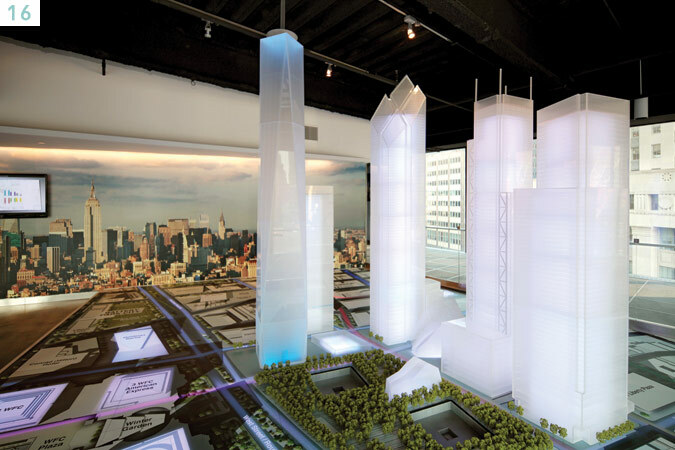 The list of architects, designers, and business leaders includes: David Childs, Zaha Hadid, Greg Lynn, Laurie Olin, Wolf Prix, David Rockwell, Moshe Safdie, Patrik Schumacher, and Ben van Berkel. That's no joke. Among other things, the group will strive to promote higher quality projects, greater efficiency, and more cost effective techniques. "We have a tremendous opportunity to be better and more efficient," said Gehry Technologies CEO Dayne Myers. He and Gehry Technologies' Chief Technology Officer Dennis Shelden suggested that the group, which will meet in person once a year and via conference call quarterly, could address the industry's crippling wastes in time, money, and materials by promoting better work flow and communication, among other things. "When this group speaks it's going to carry a bigger weight than any of them individually, or just Gehry Technologies," added Shelden. Kicking things off the company just announced a partnership with Autodesk to improve the capabilities of Building Information Management (BIM). 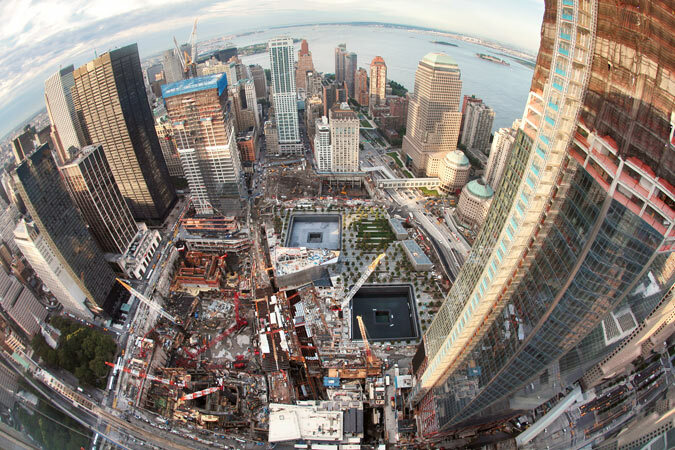 In an unprompted statement from the AIA, which offered its support as well, AIA President Clark Manus pointed out that "as much as 30% to 50% of all time, money, materials, and resources that go into a construction project do not add value to the final product." That's impressive too, just not in a good way. Moshe Safdie's partially completed West Edge in Kansas City. 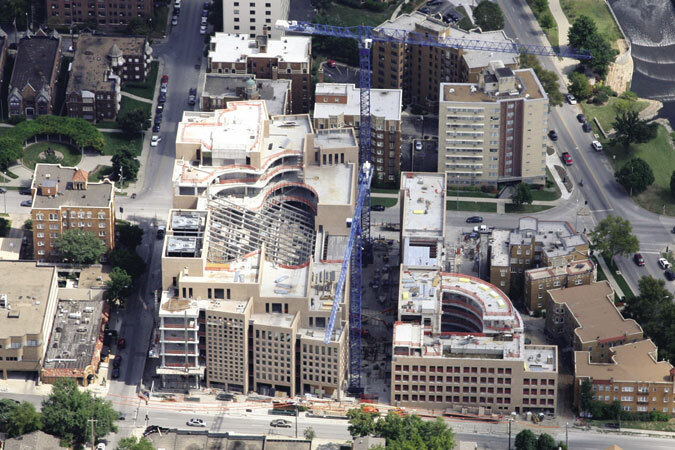 In a dramatic turn of events, opposition to the construction of a new office tower in the Country Club Plaza district of Kansas City, Missouri faded for good in August, when law firm Polsinelli Shughart chose the site of the unfinished West Edge development designed by Moshe Safdie for its new headquarters. 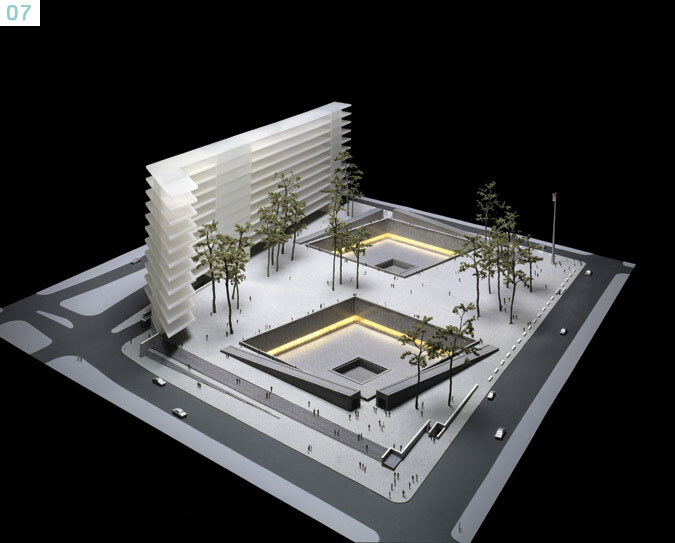 After months of battling over another site on the Plaza, Polsinelli announced that the office portion of the project, an unfinished structure that was originally designed to suit advertising agency Bernstein-Rein, will be demolished and replaced with a new office tower. 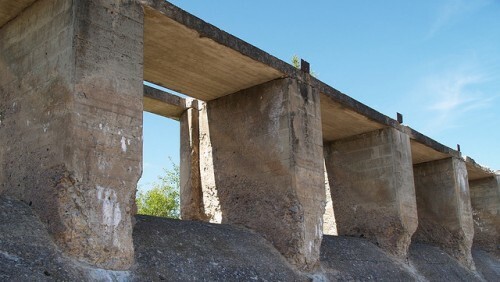 Selective demolition of the structure began September 26. Safdie Architects declined to comment for this story. 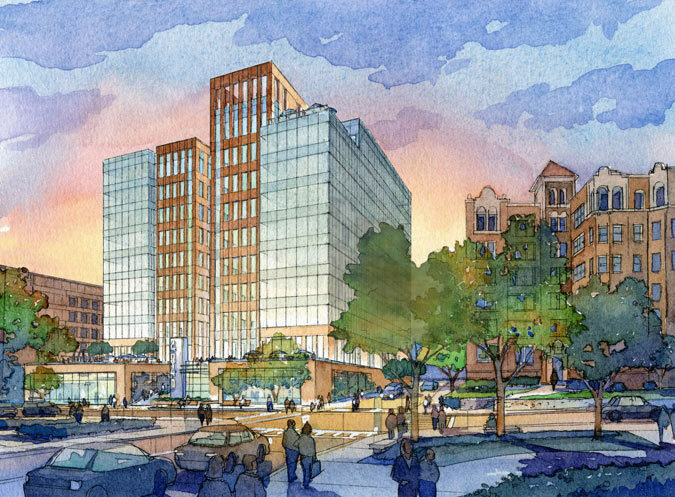 In a statement, Kansas City Mayor Sly James said, “The West Edge location helps to replace an abandoned project, eliminates the controversy of the site on the Plaza, and retains a valuable corporation and its employees in Kansas City." 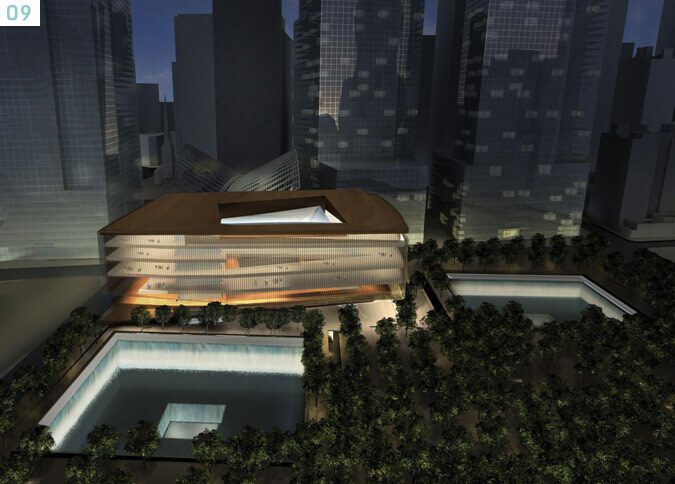 The Safdie-designed hotel and garage will remain. The saga surrounding the site goes back nearly a decade when current owner Cecil Van Tuyl proposed a redevelopment that was ultimately rejected due to public opposition. After the West Edge development under new owner Trilogy Development was approved five years ago following an extensive community planning process, Trilogy filed for bankruptcy in 2009 as construction was nearing completion. At an auction in 2010, Cecil Van Tuyl with partner B.B. Andersen bought the project for $9.5 million. Last February, Van Tuyl was sued by his now former partner Andersen under claims that he violated their original contract. It is unclear how this lawsuit will affect the overall project. 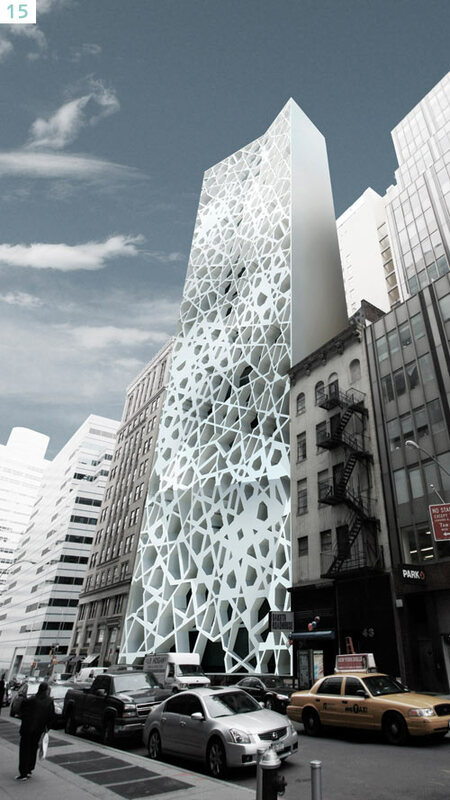 The design for the new office tower. 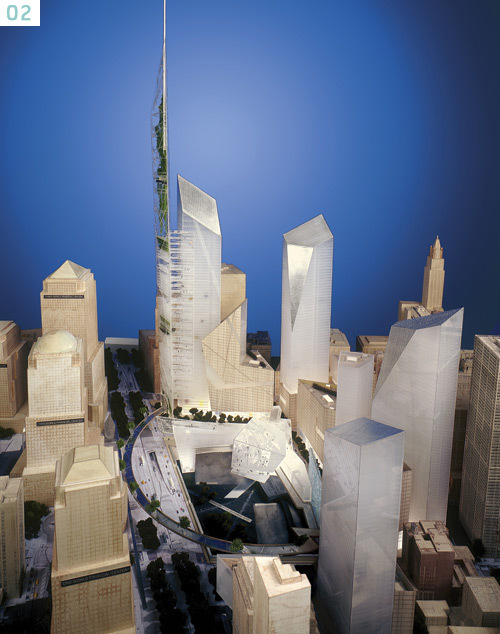 The new office tower is expected to open in the fourth quarter of 2013. At this point, Kansas City is hoping that this long battle comes to a close. 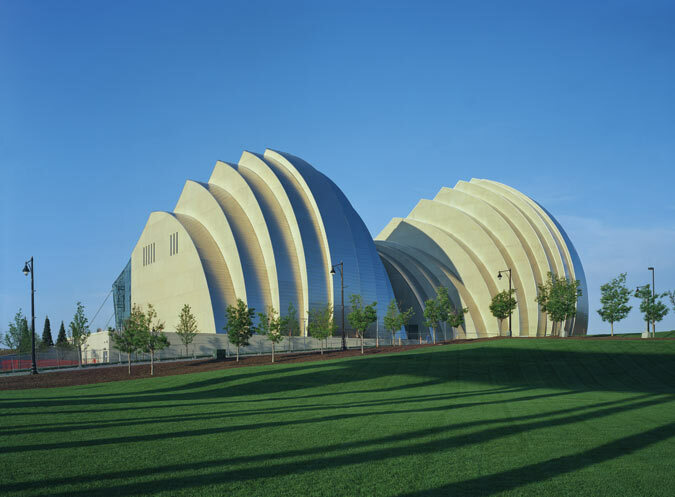 Kauffman Center for the Performing Arts in Kansas City, MO. 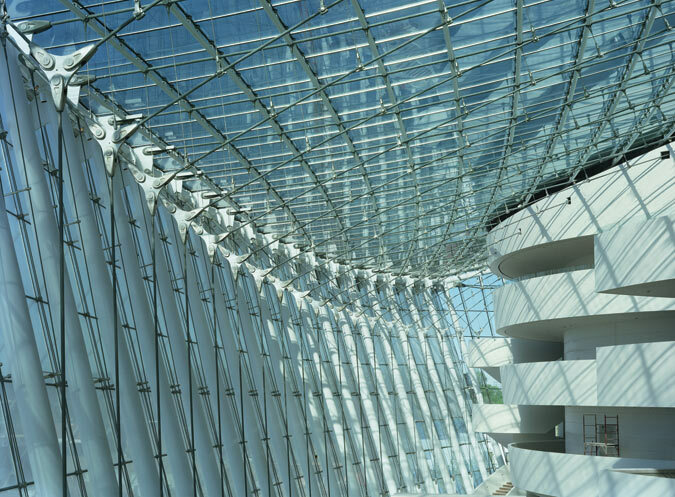 On September 16, the Safdie-designed Kauffman Center for the Performing Arts (KCPA), a 285,000-square-foot, $326 million complex that will be the home of the Kansas City Symphony, Lyric Opera, and Kansas City Ballet had its grand opening performance by world-renowned tenor Placido Domingo in the 1,800-seat Muriel Kauffman Theatre. 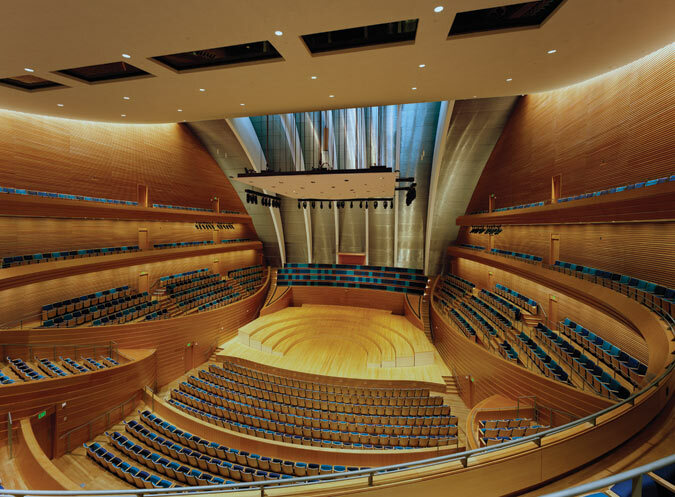 On September 17, the opening festivities continued with violinist Itzhak Perlman in the 1,600-seat Helzberg Hall. Left to right: The Kauffman Center backs up to a new park built over underground parking; the cable-stayed glass foyer is a vast new public gathering place; inside the theater space. Central Avenue dead-ends at the KCPA exactly where the space between the two performance halls creates the cavernous north entrance. This dramatic back end serves as the gateway for the Bartle Hall Convention Center and the rest of the downtown central business district. Set at the foreground of the downtown Kansas City skyline, the KCPA plays a supporting role with its taller neighbors. 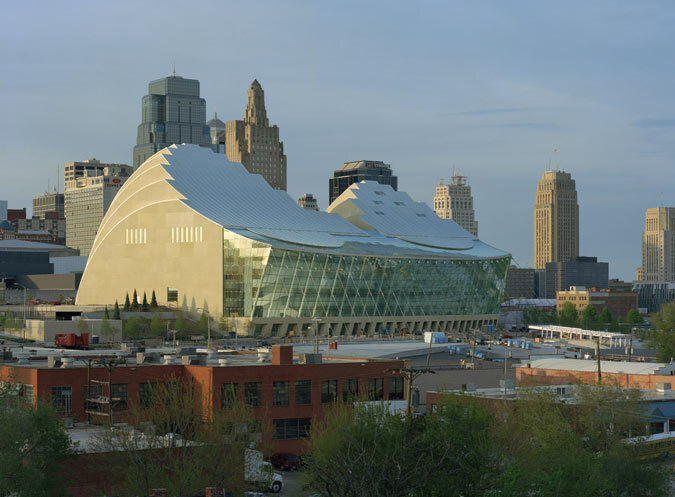 Its sloping curves emerging from a hilltop vantage-point both embrace and accentuate Downtown Kansas City. 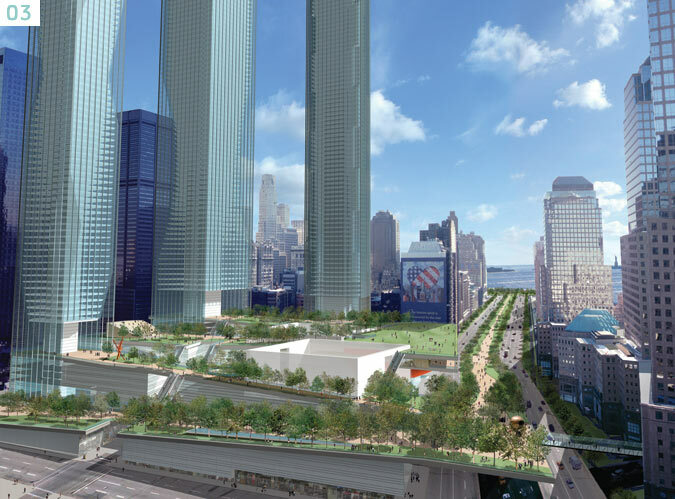 “Its location shifts the center of the upper and lower city,” Safdie said. Downtown Kansas City sits atop the bluffs at the confluence of the Missouri and Kansas Rivers. Aban-dam-ment. Atlas Obscura posted several images of the abandoned 1906 Pinawa Dam in Manitoba, Canada on the Winnipeg River. After its decommission in the 1950s, the dam was later used for military training. Quite literally bombed out, the dam stands as a scarred relic and reminder of the once highly functional hydro-electric generating station. Campus Tour. Architectural Digest compiled a list of top colleges with the best architecture, spotlighting both old and new including UVA's World Heritage-listed campus, Harvard and Yale's 18th century history mixed with modern architecture, and Frank Llyod Wright's presence at Florida Southern College. International Green. International landscape designers Gillespies developed three "rooftop sanctuaries" that take their visitors around the world. With inspiration drawn from Indonesian, Japanese, and Moroccan traditional gardens, the result was "a series of posh but welcoming spaces ranging from the intimate and serene to the open and flourishing." Inhabitat has a virtual tour. Moshe's Fall. 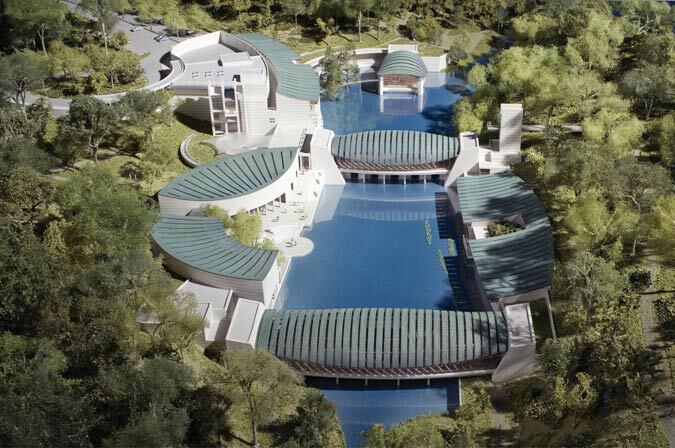 Architect Moshe Safdie is expecting to open four projects to the public in the next few months. ArtDaily profiled of each of them, including the Kauffman Center for the Performing Arts, Kansas City (September 16), United States Institute of Peace, Washington (Fall 2011), Khalsa Heritage Centre, Anandpur Sahib, India (Fall 2011), and the Crystal Bridges Museum of American Art, Bentonville, Arkansas (November 11). Lebbeus Woods, D-QUAD 44A2, 1988 from the series Centricity. Often formulaic, most museum presentations contain beautiful models, large photographs, a video interview, and occasionally ephemera from the design process. When shows have big budgets and a lot of space, like MOCA’s famous History and Legacy of the Case Study Houses exhibit of 1989, you can even get a reconstructed house or two. But SFMOMA’s modest show ParaDesign, really pushes these boundaries. This is because it’s a show of the marginalized or in-between pieces of an architecture and design collection. Attention is paid to the pieces that don’t really fit. Instead of forgetting them in storage, curators Henry Urbach (who just announced his departure from the museum), Joseph Becker, and Jennifer Dunlop Fletcher decided to foreground the pieces and dub them “ParaDesign.” In defining the “other,” they have been relieved of the burden of a traditional presentation format. And for the most part, they have succeeded. ParaDesign and the adjacent show on the work of the late designer Tobias Wong serve to slow us down. The two shows, which work together, allow us to explore the practical and aesthetic limits of design production. 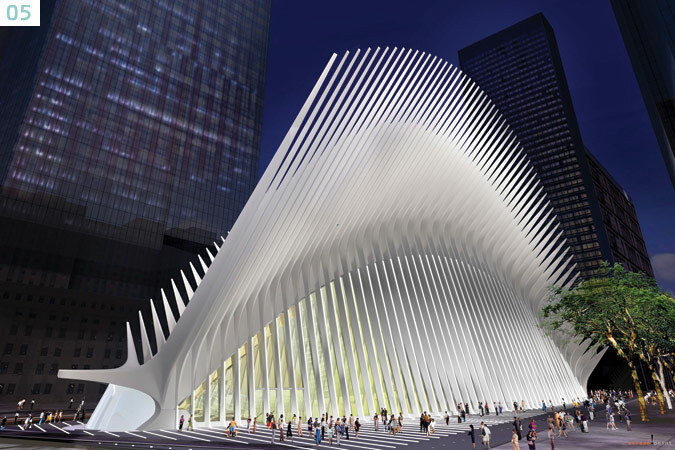 We need to think about what is happening alongside art, architecture, and design as we make it, they seem to suggest. Although it was conceived after the main attraction, the Tobias Wong exhibit feels like the catalyst for the larger show. This is appropriate given the memorial nature of this first museum presentation of Wong’s work since his tragic death in 2010. Lying in the center, in the shape of a body, is his famous Bulletproof Quilted Duvet. Many of Wong’s most famous pieces, the McDonalds’ stirrer repurposed as Coke Spoon 02, the Skull Matchbook, and the quilted Disposable Crystal Cup, are presented like jewels from Tiffany & Co., which he also spoofed with rubber-coated pearls. Although some pieces are witty one-liners, like Unauthorized Burberry Buttons, others have more layers, like his last work, New York I Love You But You’re Bringing Me Down, the title spelled out in morse code with wood beads. Acutely aware that Wong has recently died, the curators made the other gallery spaces somber. The bold use of color, a strategy commonly used to enliven design shows, is unnecessary here. Instead, the curators are bold in their use of space. If you are going to make an argument for bringing marginalia forward, the pieces need room to breathe. Diller + Scofidio’s witty Soft Sell, a video projection of scarlet red female lips, welcomes the visitor into the show. The walls in this first gallery are black and the objects mostly clustered in the center of the room, as if a sheet were going to be thrown over to paint the room. There are no identifying tags, a move that invites viewers to walk around the pieces and look longer. In the larger gallery, the walls are mostly white. A line of exhibit cases marches down the center, holding an array of wonders. Diller + Scofidio’s Dispensary, from the series Vice/Virtue, is haunting. If these are their sketchbooks, it’s no wonder their buildings are getting so much media attention. A highlight is Heshotmedown, which was made by R&Sie(n) using new modeling software and techniques exploring the terrain of architecture and material. An older piece, Plasmorphica #1, by Aziz + Cucher, evoked memories of modern but outdated medical equipment. Their photograph entitled Interior #1 looks familiar until one realizes that it appears to be a passageway covered in human skin. The curators borrowed the stacked style of 19th century exhibition design to show the work of illustrators and photographers. 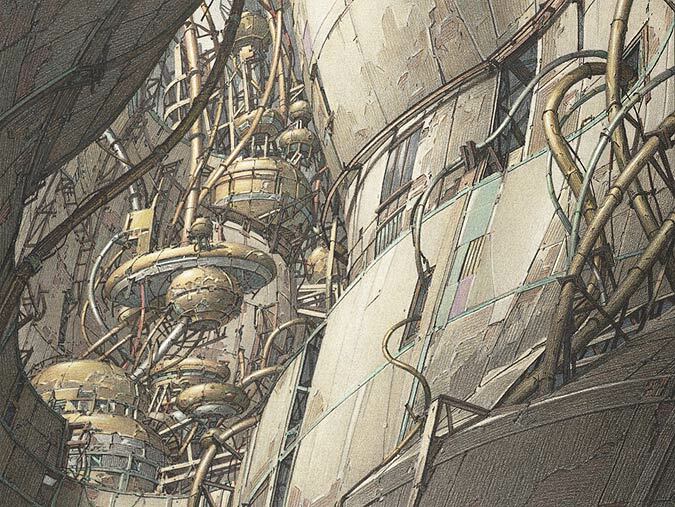 While some distance works well enough for some paintings, it doesn’t work so well for Lebbeus Woods’ finely detailed drawings. But that is the cost of experimentation. Suspended from the ceiling is the triumph of the show, Clouds, by An Te Liu. 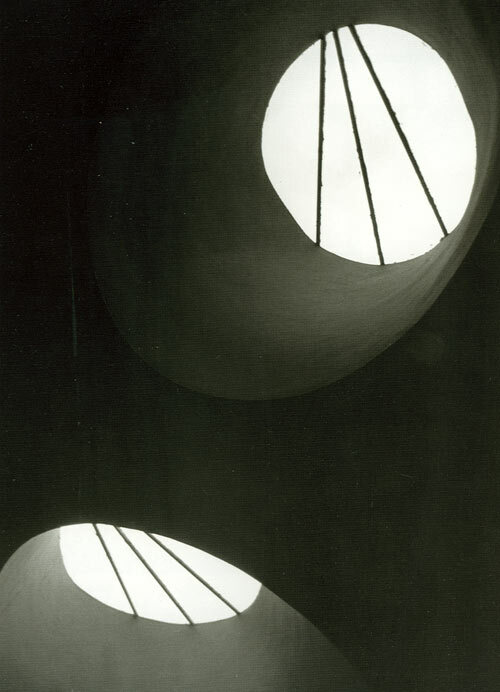 Its sculptural air purifiers bring to mind Moshe Safdie’s Habitat ’67, except the shape is more horizontal. You can observe patrons reaching up and trying to feel the air movement as they hear the whirring fans. 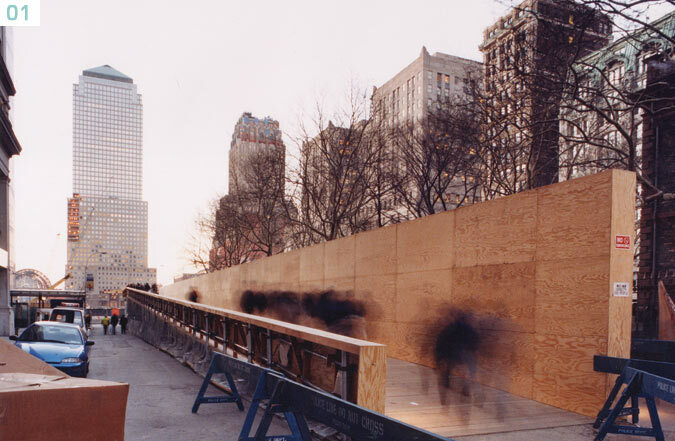 Perhaps the most brilliant move was to leave the walls on either side of the floating sculpture free. This is a lot of valuable real estate to give up, but it shows that this new movement is about space and sound as much as the visual. Unfortunately, the design of the exhibit’s information placards makes them confusing to use. But that’s a small price for this victory of experimentation. ParaDesign and its ancillary Tobias Wong exhibit demonstrate that you can rescue and foreground the uncharted terrain with thoughtful deliberation and a few bold and insightful moves. 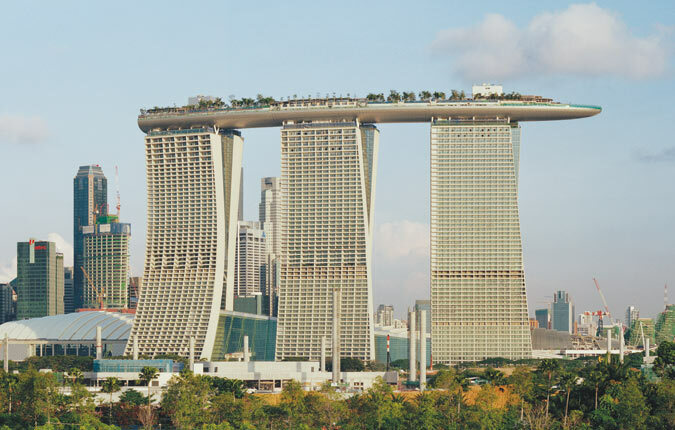 In 1971, Moshe Safdie was one of the most famous architects in the world. He was only 33, but his face appeared on the cover of Newsweek as the designer of Habitat for the 1967 World Expo in Montreal. He had submitted the design—basically his master’s thesis for McGill University—while an apprentice in the office of Louis Kahn. Its selection made him an international design star overnight. 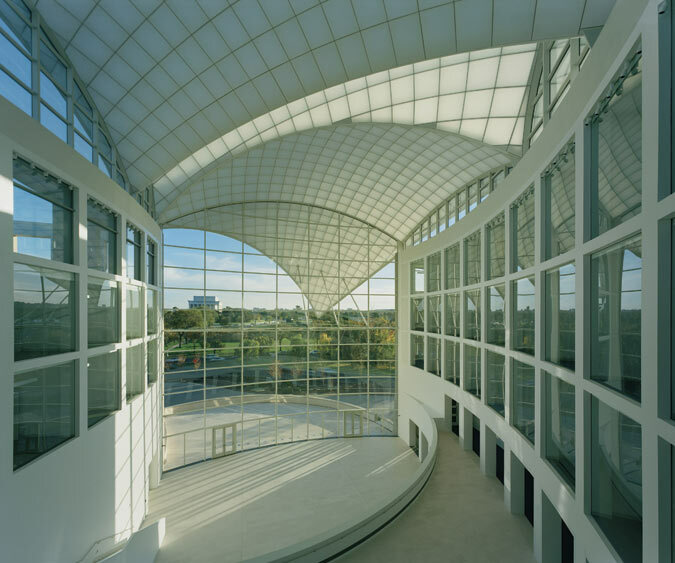 In 1978 Safdie moved to Massachusetts in order to teach at Harvard’s Graduate School of Design. Many projects followed, notably among them the Yad Vashem Holocaust Museum in Jerusalem and the Montreal Museum of Fine Arts. The firm now maintains satellite offices in Jerusalem and Singapore, but the Somerville, MA, studio remains the firm’s primary home base. Here the staff of seven works in a state-of-the-art model shop from the conceptual stage through full-scale mock-ups for every project. 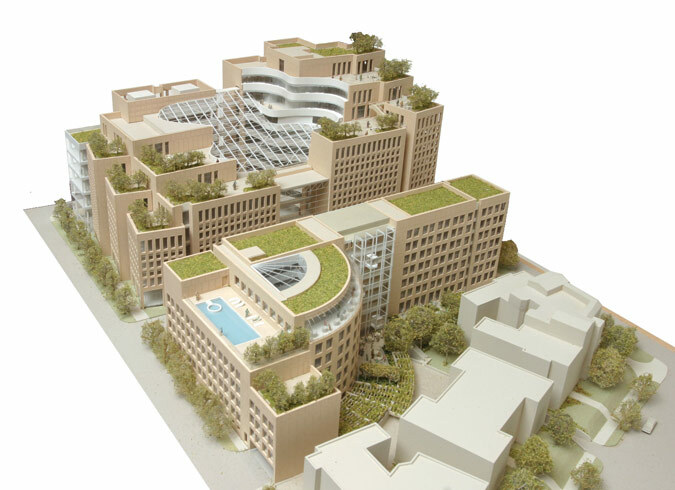 Throughout, Safdie has remained true to the core principles established at the Habitat housing complex: buildability, integration into the public realm, and humanizing the mega scale. Finally, Safdie, not wanting to be a “fly in and fly out” academic, began a fellowship program in his office in 2004. The program endows two fulltime architectural researchers, $65,000 each, to spend a year with him exploring a single project to be presented to the staff and inspire future work. The next two years will see an important handful of completed buildings opening in the United States, India, and Singapore. 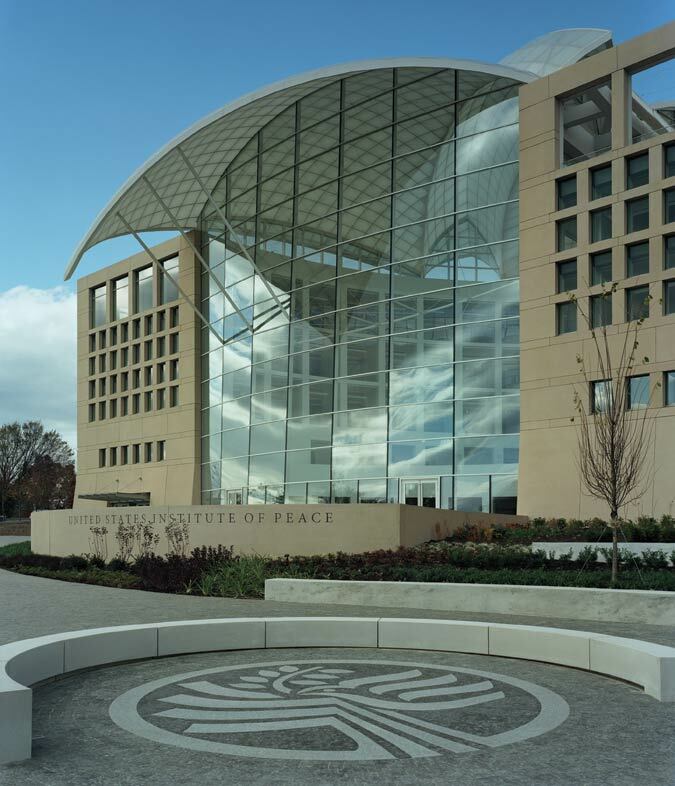 A research facility, conference center, and museum dedicated to the theme of peacemaking, the $186 million facility is a public-private partnership that will significantly increase the Institute’s programming and activities. The building is organized around two atria, creating spaces for both scholarly research and public activity. 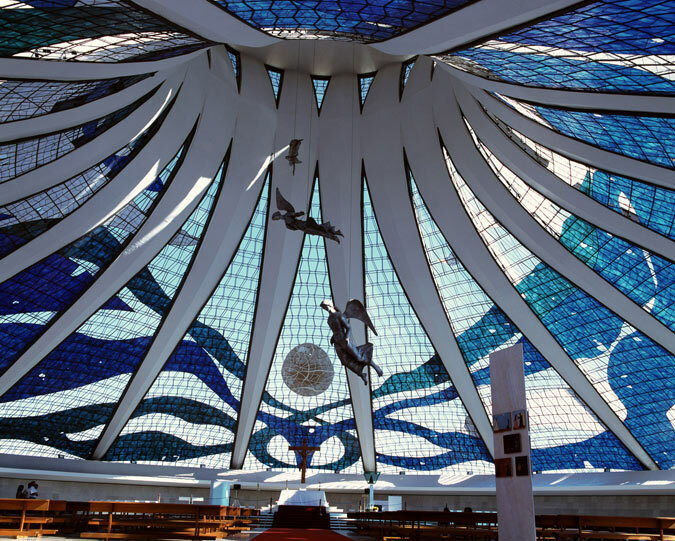 The frame and translucent glass roofs suggest the wings of a dove, the symbol of peace. 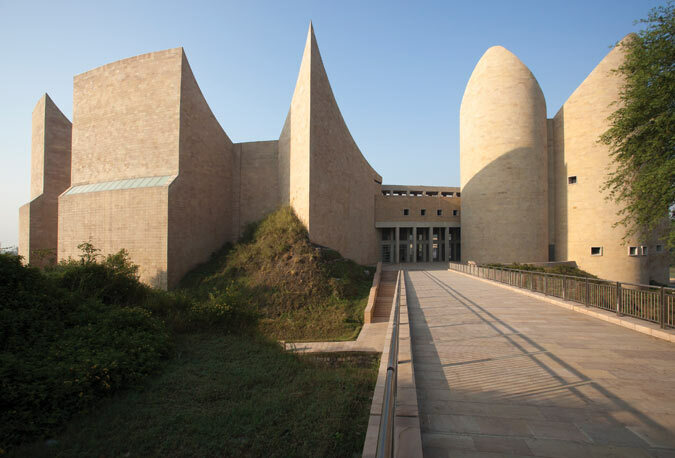 This museum and cultural center celebrating 500 years of Sikh heritage has been a work in progress for 13 years. 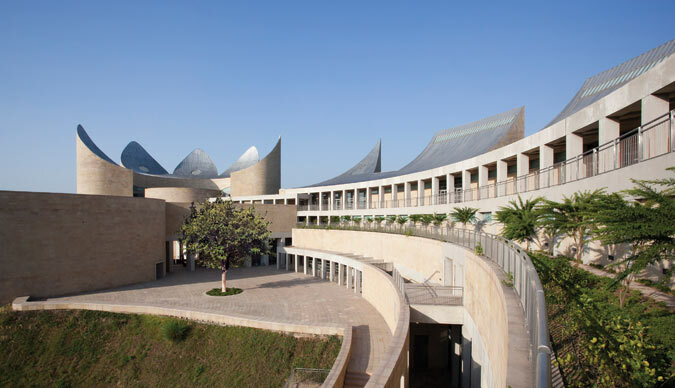 At 70,000 square feet, it sits on a 100-acre site situated between the sand cliffs of the holy city of Anandpur Sahib and Punjab, just north of Chandigarh. 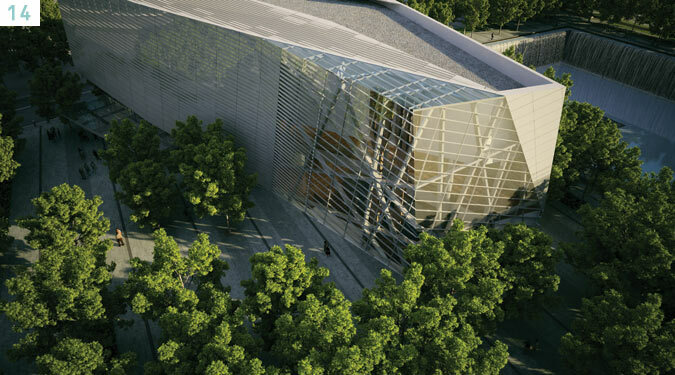 It houses galleries for changing exhibitions and a two-level research and reference library centered on a grand reading room overlooking water gardens. 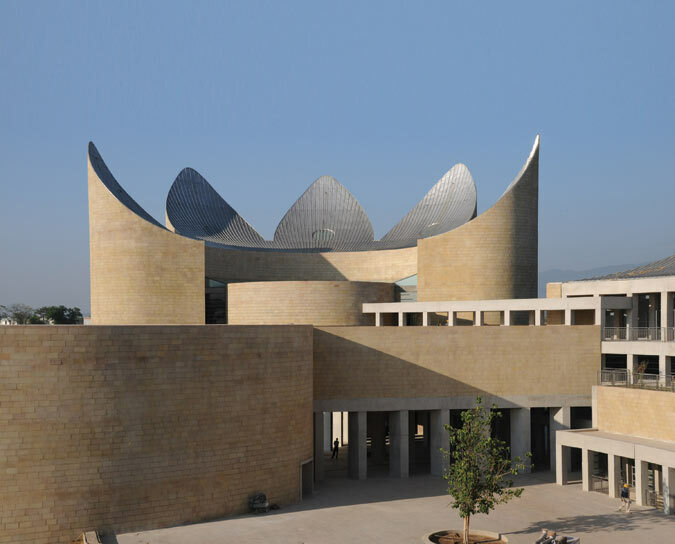 Its two sandstone towers have upwardly curving roofs covered in stainless steel to provide communal spaces that respond to the needs of celebrating Sikh aspirations and traditions. 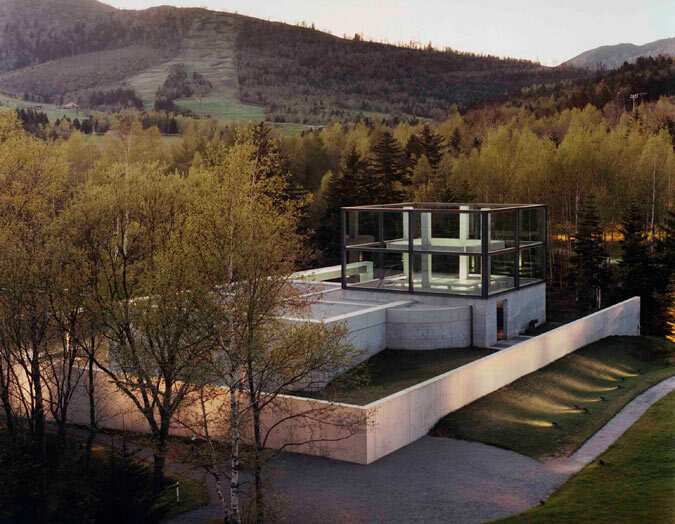 This project seamlessly integrates art, architecture, and landscape within a series of wood and concrete pavilions nestled around shallow ponds fed by a nearby natural spring. The design is focused on protecting the natural beauty of its forested site and emphasizes a strong sense of place by utilizing regional materials. Walking trails and a sculpture, including a site-specific work by James Turrell, will link the 100-acre site to downtown Bentonville. 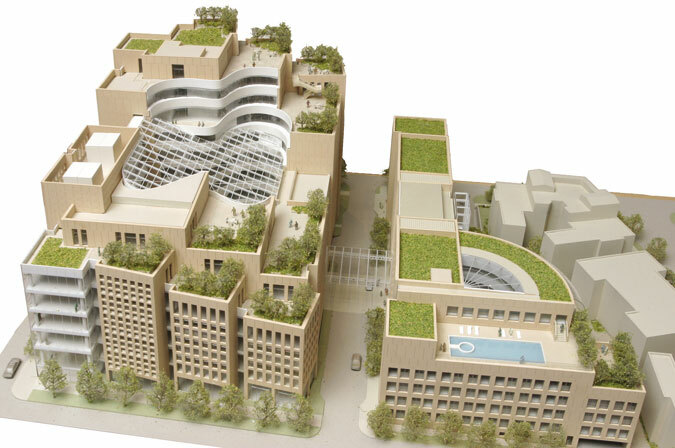 Safdie's partially-completed West Edge project has seen its share of recession-related setbacks. 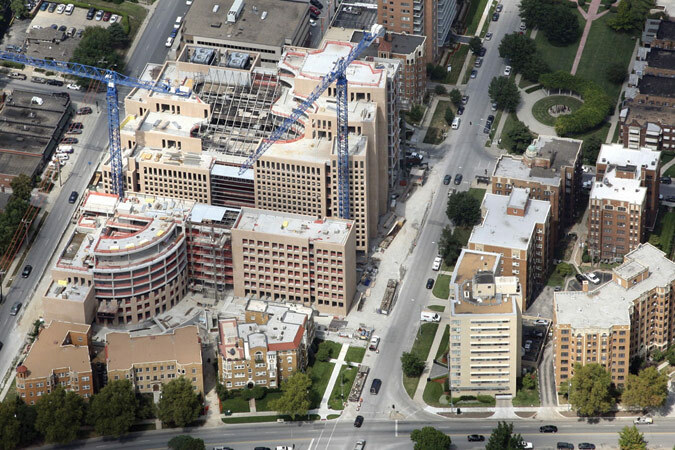 Two of the four cranes on the skyline in Kansas City are for major Moshe Safdie projects. 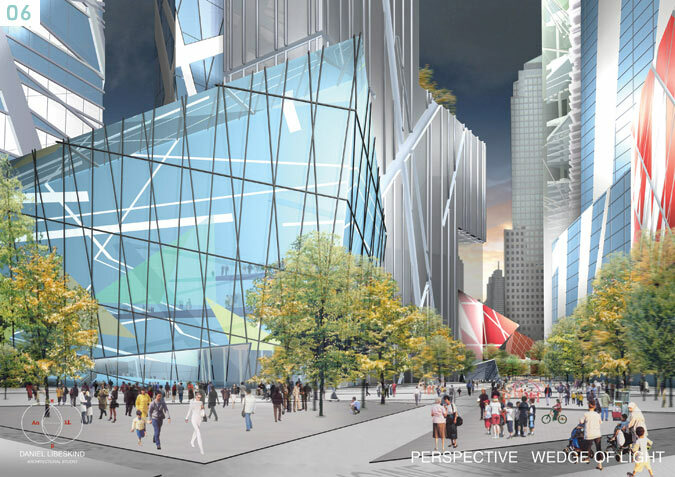 The developments—the West Edge, a $80 million mixed-use complex, and the Kauffman Center for the Performing Arts (KCPA), a 285,000-square-foot, $413 million project that will house the Kansas City Symphony, Lyric Opera, and Kansas City Ballet—are not proceeding with equal ease. On September 25, the KCPA held its one-year to completion party, but backers of the West Edge development, a 203,000-square-foot, nine-story project, are singing a different tune. 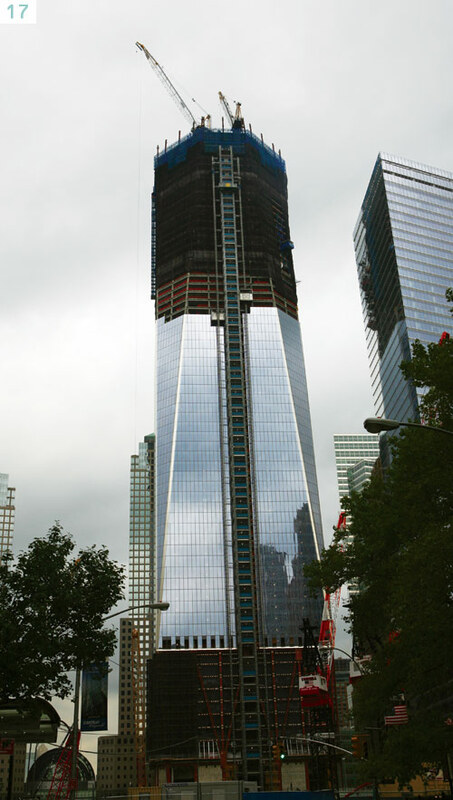 On August 28, the half-completed project sold at auction for $10 million. That bid, as has been the history of this project, fell apart on October 12, and the second bid from the previous owner and original proponent of a mixed-use development secured the property for $9.5 million. A casualty of the recession, the West Edge development has been hampered by delays, cost overruns, and the bankruptcy filing of its initial developer. Its new owner, Cecil Van Tuyl, has yet to confirm if the hotel, office, and retail complex will be completed with the same composition or the same architect. "This was a custom-designed office building like a made-to-measure suit. 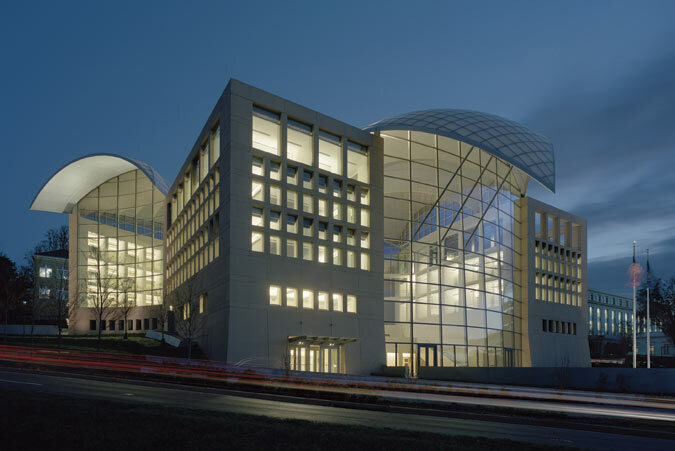 It is unfortunate that those who the building was designed for are not going to be benefiting from the fruits of their labor," Safdie told AN. The West Edge massing has been tailored with a complex series of step-downs, cut-outs, and atria to fit into the neighborhood context. 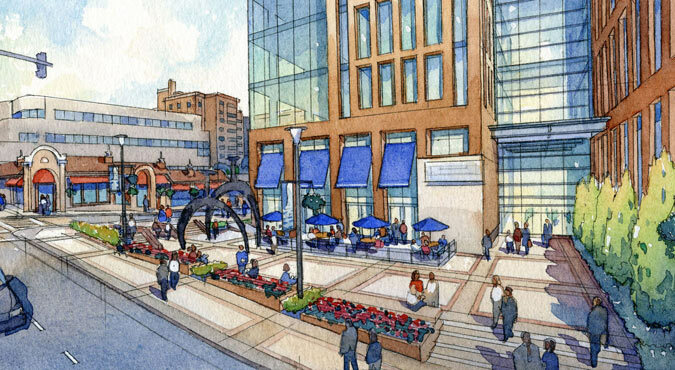 In the 1990s, Cecil Van Tuyl proposed a massive redevelopment at the location of the West Edge project only to be rebuffed by community opposition. When Bob Bernstein of Bernstein-Rein Advertising created Trilogy Development to develop a custom-made office complex for his firm, he learned from this earlier attempt. 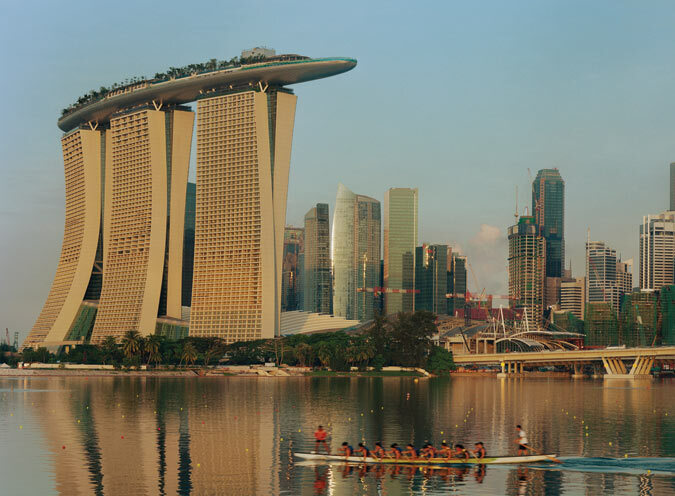 Through an international competition that required and sought significant community input, the Moshe Safdie project easily navigated the approval process. With its curb cuts limited to a private drive through the center of the site, glass atriums stepping down toward Brush Creek, and the tapering of building heights from high to lower density areas going east to west and north to south, the project was designed to fit into the character of the neighborhood. Yet down the road and only a few miles to the north, the KCPA has a very different relationship with the city. 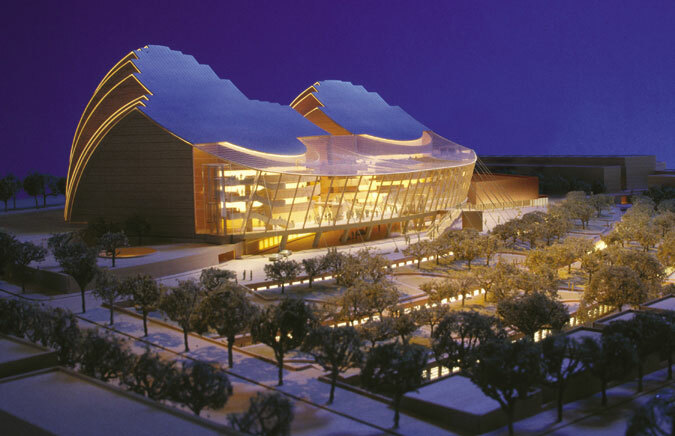 Shortly after winning the competition for West Edge, Safdie was invited back to Kansas City by Julia Kauffman, daughter of Ewing Kauffman of the Kauffman Foundation and Marion Laboratories, to assist the design of the nascent civic project, whose total budget includes $326 million devoted to the performing arts center itself, plus a $40 million endowment and a $47 million, 1,000-car underground parking garage funded by the city. 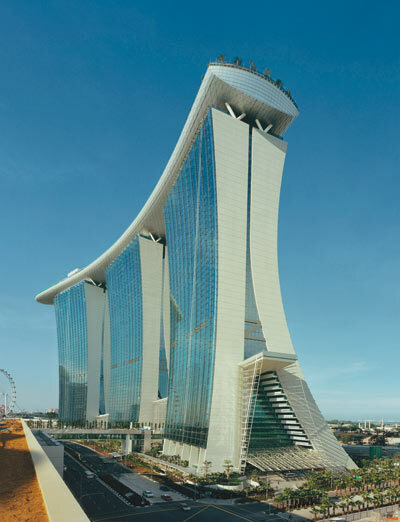 Safdie said, "The relationship cemented itself fairly quickly, and within a few weeks I was working on my designs." Instead of forcing the programming into one multi-purpose event hall, the project contains two venues tailored specifically to its users. The two large shells mark the emergence of each venue from a grand foyer and lobby that faces south toward the city. The Kauffman Center for the Performing Arts will contain two performance halls and a grand, glazed foyer gesturing toward the city. Somewhat shielded to the north from Kansas City's downtown skyline, the second primary entrance is an extension of Central Avenue, which becomes the cavern between the two performance halls and provides access from the Bartle Hall Convention Center directly to the north. 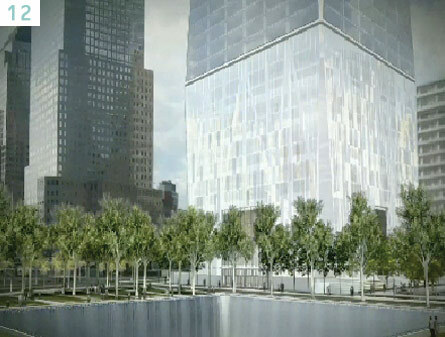 "I hope this building will change the self-image of the city," said Safdie. "It is very iconic because it is memorable, it is talked about, and it elicits, I hope, affection." 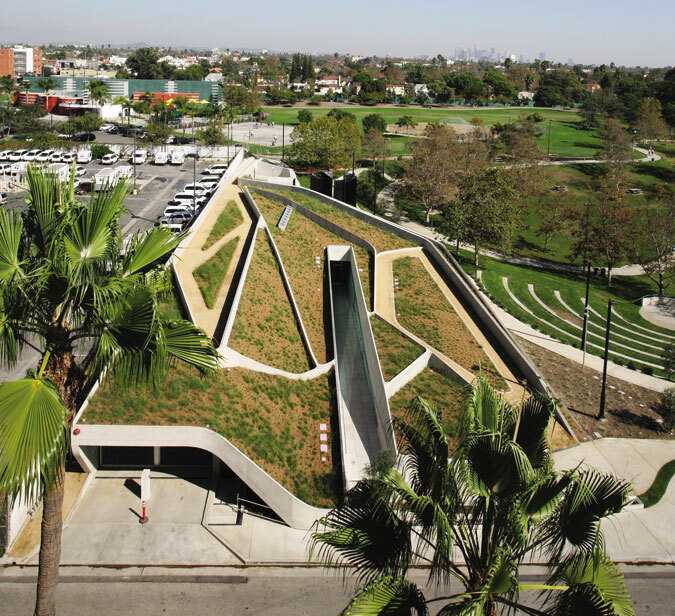 Architect Hagy Belzberg's boldest move was to partially bury the museum under a rolling terrain that serves as an extension to an adjacent West Hollywood park. visitors enter through a descending ramp that seems to slice through the landscape. 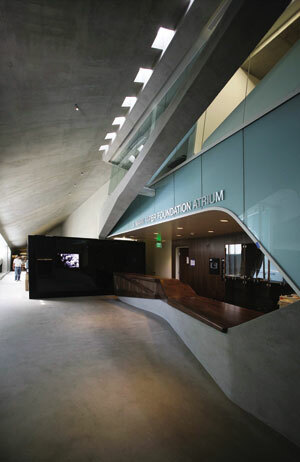 the museum's emotional charge is heightened by sloping ceilings and light-streaked spaces. Generally, the most effective architectural designs make you feel welcome and comfortable. But in a museum meant to recall the horrors of the Holocaust, that mission is turned on its head. So it’s no surprise that the most emotionally resonant spaces in the new Los Angeles Museum of the Holocaust are those where the rawness and constriction of the building evoke a period that the museum doesn’t want you to forget. Disjointedly located in Pan Pacific Park just behind the hyper-happy Grove in West Hollywood, the museum, designed by Belzberg Architects, is the new home for an institution that has existed since 1962. 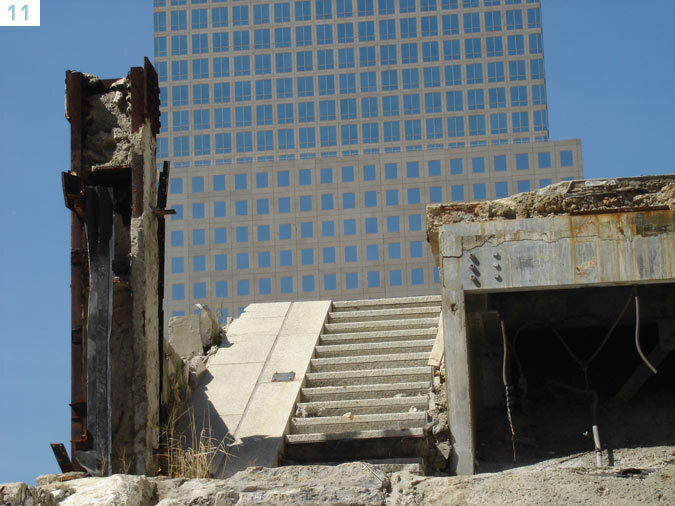 It previously occupied a relatively small and unremarkable space in an office building on Wilshire Boulevard. 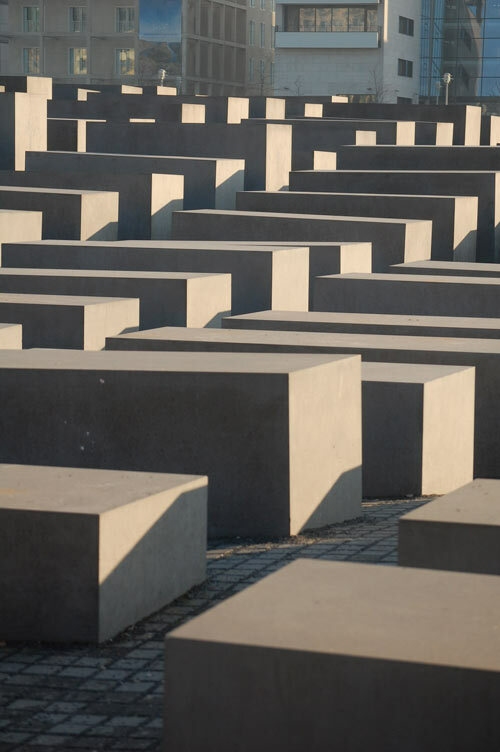 Belzberg didn’t have the size or the budget of some of the world’s more famous Holocaust museums, such as Daniel Libeskind’s Jewish Museum or Peter Eisenman’s Memorial to the Murdered Jews of Europe in Berlin, or Moshe Safdie’s Yad Vashem in Jersualem. But within a 32,000-square-foot footprint, at about $350 a square foot, he managed to accomplish a lot. 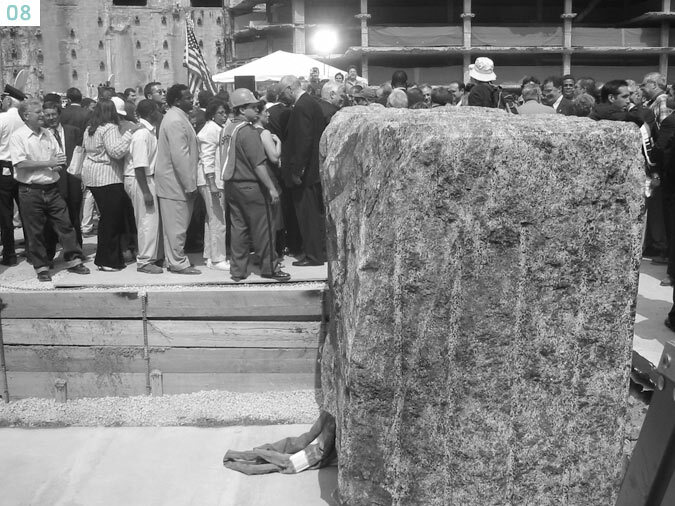 The boldest step was the decision to bury the museum underground, preserving the rolling parkland that was donated to the museum by the state and highlighting visitors’ movement into a realm distinct from their ordinary lives. 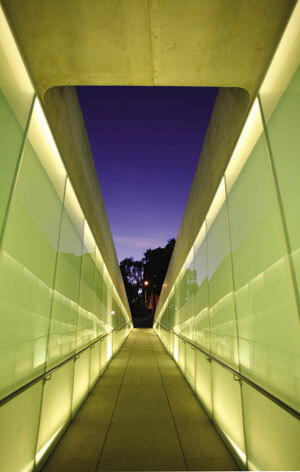 The structure’s undulating form echoes the curving landscape; the roof is planted with native fauna and a natural irrigation system, and concrete-lined pathways zigzag sharply, preserving the calm of the park but indicating that all is not quite right underneath. That sense of discomfort is heightened right away by twisted shotcrete columns, which were formed from digital models and sculpted while still wet by a local pool contractor. 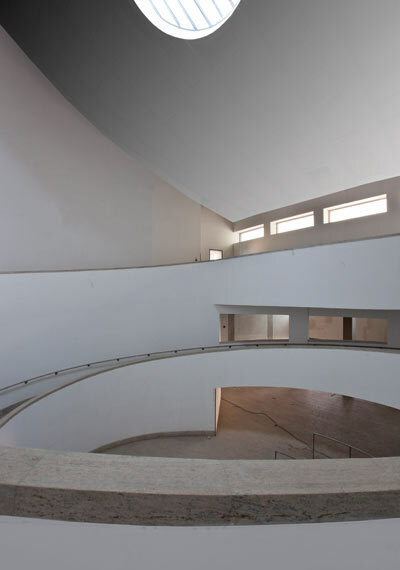 Bleak raw concrete walls and ceilings slope in multiple directions, throwing perspective off and evoking a grim, trapped feeling. Descending into the story of the Holocaust—told in separate spaces formed by flexible black cubicles that open up to the museum above—the sense of compression and darkness increases. The story starts in pre–World War II Europe; then the lights get dimmer and the ceilings lower as the full horrors of concentration camps and mass killings of the Holocaust unfold. Finally, as the stories of hope and liberation are detailed, the visitor turns a corner and returns to the light. 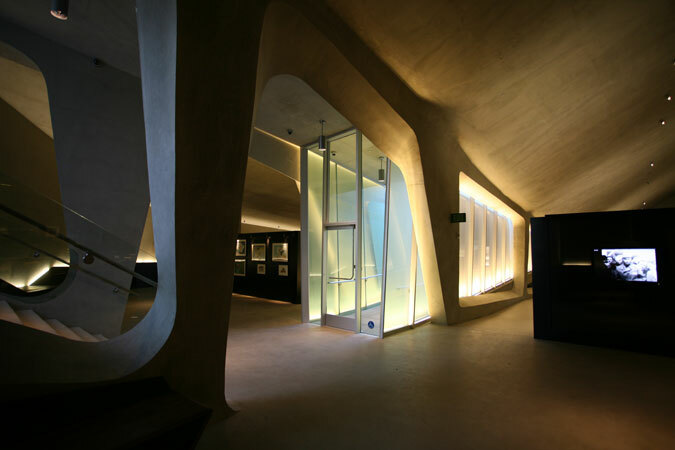 Twisting shotcrete columns contribute to the sense of spatial compression. An educational system, via iPod, provides a more interactive experience. Exhibits include films, memorabilia, models, and digital components—including touch-screen technology—that allow more to be told in this relatively small space. One of the most powerful aspects of the experience are the glimmers of natural light coming in from above, through translucent glass that reveals both glow and movement, but not clear views. The murky light provides some orientation while also evoking a sense of the isolation that Jews must have felt at the time. In a children’s memorial outside, the sound of children playing in a nearby park trickles in provocatively as you sit in a constricted space with only the sky above you. Nearby lies an amphitheater and a large memorial sculpture of black steel pillars by architect Herb Nadel that the museum inaugurated years ago. 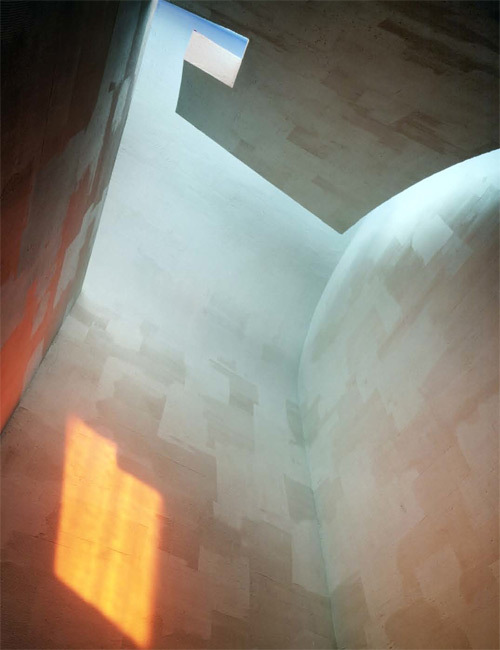 Exhibition spaces are washed with subdued light through translucent glazing. I went through the museum twice, measuring my reactions. Belzberg could have gone even further with the darkness, twisting, and compression. Now you can only move so far into the darkness, while it might have been even more effective to make some exhibit walls touch the ceiling, heightening the sense of isolation. Concrete walls, ceilings, and floors make the space noisy, dulling the sense of dislocation as you move into the story. Still, bold gestures far outweigh any shortcomings. 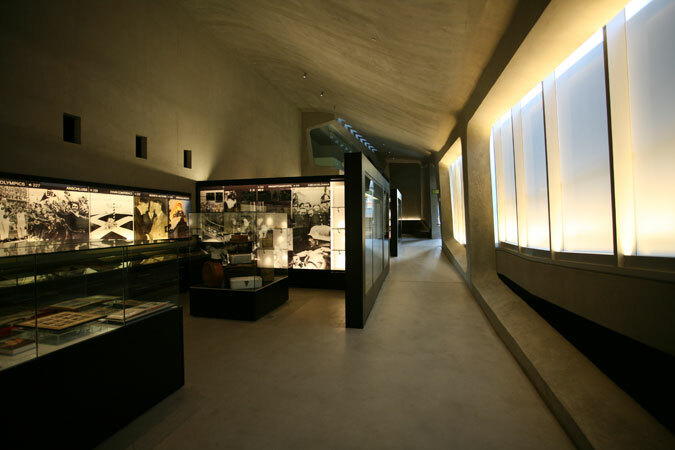 Under difficult circumstances, Belzberg has created a memorable museum that broadens understanding not only of a horrible time but of the raw emotional impact that architecture’s spatial and tectonic qualities can deliver.